Photo: One of Thaton's many pagodas. Found at the busy junction of the highway for Hpa-an, Myawaddy and Thailand and the main Yangon to Mawlamyine route, most tourists will see Thaton as a flash through a bus window. But Thaton is home to a lively market, a few interesting temples and some fantastic architecture, so if you’re not in a rush it’s a quirky, decidedly off-the-beaten-track spot worth a look. Alternatively, as it’s less than 50 kilometres from Hpa-an, it can also make for a good day trip. Plenty of local buses run between the two towns, but it’s also a pleasant drive on a rental bike if you have one. With an original incarnation as an early Mon trading emporium, little Thaton is probably one of the oldest continually inhabited towns in the entire country; it’s even thought to have been noted as a recognised entrepot by the ancient Romans. However these days, with Mon archaeology not high on the Burmese Ministry of Culture’s priority list, there’s not a lot of evidence remaining of its lengthy history. Today it’s a bustling, congested market centre and transport hub. The town began life as a trading port on the India/Sri Lanka to China route and became an important outpost of the Mon Dvaravati Kingdom. Centuries of coastal silting however means that today Thaton is some 16 kilometres from the Gulf of Martaban. It now lies astride the main Yangon highway rather than the Indian Ocean and is an important spot for land transportation of goods and passengers to Thailand or all points south rather than Brahman priests from India, Buddhist thinking from Sri Lanka and porcelain from China. You’ll see the usual mix of Bamar and Chinese and Indian Burmese residents around town plus aside from the Karen and Mon there’s also a Pa-O population in the surrounds as they have migrated (or more likely been re-located) further south from their traditional home in Shan State. Don’t be put off by the traffic-clogged hectic centre along the main highway. Stroll through the lively market or head up to the scenic mountain-top temple by way of quiet streets lined with a well–preserved collection of old British-period villas. Thaton’s extensive display of colonial architecture came as an unexpected treat, and it shows the town’s importance during imperial times as being way above that of, for instance, nearby Hpa-an. The area to the east of town defined by the highway and nearby hills has a grid of wide, tree-lined streets housing a tremendous array of old houses and villas. A century ago this was the posh part of town. The first block east of the highway has seen the most redevelopment but continue past Hospital Street to the north and east and you’ll find street after street of virtually uninterrupted old buildings. A stroll east from Blue Cloud zigzagging towards the foot of the steps leading up to Myathabate Pagoda will provide you with a good sample; First Mountain Cafe by the pagoda steps car park makes for an excellent mid-walk coffee break. As you arrive at one of the bus stops around the central clock-tower traffic circle in Thaton, you’ll pass by a jumbled collection of old and new buildings along the narrow but busy main highway running through the centre of town. Most public buildings plus KBZ bank, the town’s main pagoda and various bus stops and ticket agencies are along here, while the main market heads west from the road. 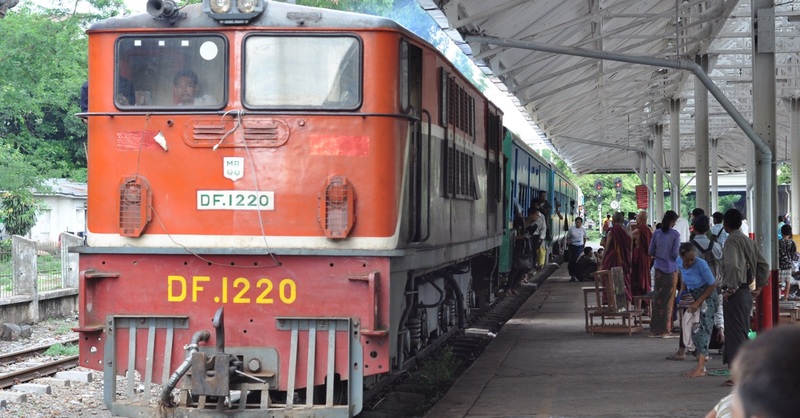 Beyond the market, ramshackle residential streets head down to the railway line and Thaton station, while just south of Shwe San Yar Pagoda a junction allows Highway 58 to head off past a couple of large resorts, towards Hpa-an and the border. The west side of town sees paddy fields and farmland stretching down towards the coast at the Gulf of Martaban, while the east is bordered by a range of tree-covered and pagoda-topped hills. The rectangle of quiet tree-lined streets between the mountain and highway, and Hpa-an route and Myathabate Pagoda Road, to the south and north respectively, houses an astonishing collection of well-preserved colonial period villas and buildings that even Dawei or Mawlamyine would be proud of. This is your best bet for a stroll and there are also a couple of decent restaurants and some accommodation on Hospital Street, which runs parallel to the main highway one block east. Police are found on the main through highway and there’s a small hospital on (you guessed it) Hospital Street behind the main pagoda. If you’re feeling seriously crook though continuing straight on to Yangon is a better idea. And if you feel like posting a postcard with a remote chance of it ever arriving, waiting for Yangon is also a better proposition. Thaton is 160 and 225 kilometres south of Bago and Yangon respectively; Hpa-an is situated some 50 clicks to the east and Mawlamyine a little over 70 south. Please sign up as a Travelfish member to download the Thaton guide PDF (2.5 MB, 16 pages). Membership costs just A$35 per year (less than A$1 per week) and gives you access to over 250 PDF guides. Browse our independent reviews of places to stay in and around Thaton. Read up on where to eat on Thaton. Check out our listings of things to do in and around Thaton. Read up on how to get to Thaton. Planning on riding a scooter in Thaton? Please read this. Use the above map to find specific destinations in and around Thaton which are listed on Travelfish. Bed icons indicate a guesthouse, hostel or hotel, the knife and fork is an eatery or bar and the four-way circular thingy marks sights, attractions and other points of interest. Click on any icon for a short pop-up and a direct link to the page for that spot. If you are in the area, use the teardrop icon near the top left to show your position on the map (you'll need to allow position sharing for this last feature to work).